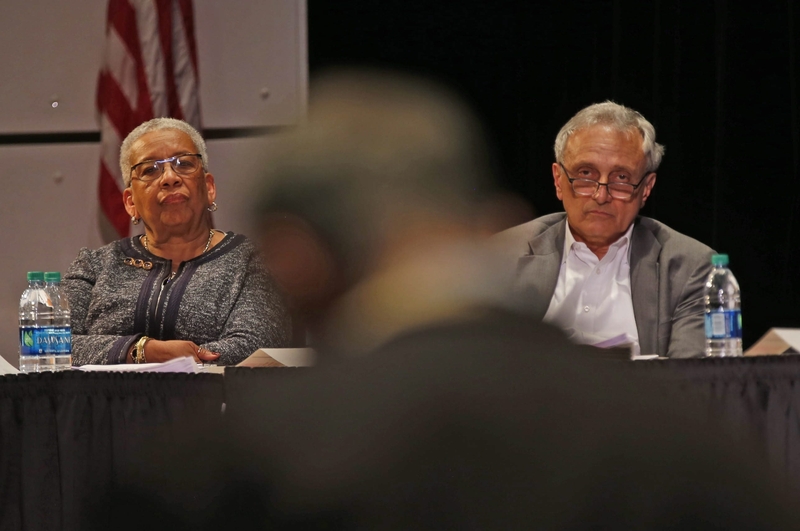 Buffalo School Board members Barbara Seals Nevergold and Carl Paladino listen to parent Mike Long as Long expresses dissatisfaction with the selection process for a new superintendent during the board’s meeting Wednesday. At least 23 people addressed the board. Members of the Buffalo School Board majority got an earful Wednesday evening as they sat through more than an hour of chastising remarks regarding their plans to appoint a new superintendent. The lively session began at 4 p.m. when dozens of Buffalo teachers demonstrated outside the meeting site to raise awareness about the fact that the board has canceled all negotiations for next month while it looks for a chief negotiator, said Phil Rumore, president of the Buffalo Teachers Federation. The teachers joined more than 100 upset residents and parent leaders, who started a separate rally at 4:30 p.m. to push for the opportunity for the community to provide input on the criteria and interview process for selecting the next superintendent. The groups also wanted prospective candidates to appear before the entire School Board and the community before one is appointed. Passing motorists honked their horns in support of the demonstrators. And by the time the business meeting began at 5:30 p.m. in the auditorium of the Buffalo Academy for the Visual and Performing Arts, angry members of the public carried their rallying cry right to board members. “Whose schools? Our schools. Who decides? We decide,” people chanted. The fray centered on the five-member board majority’s plans to appoint James G. Weimer Jr., the principal of Emerson School of Hospitality, as superintendent to take over when Interim Superintendent Donald A. Ogilvie steps down by July 1. “This is another fine mess you all have gotten us in again,” said Crystal Barton, principal of McKinley High School and president of the principals union. “The process for what we do in hiring the lead person for the district is most important. And I agree with everyone who says you have got to open the process up to all stakeholders,” she said. She was among 23 scheduled speakers during the meeting who mostly focused on a complicated and contentious hiring process. Members of the board majority bloc – Board President James Sampson, Jay McCarthy, Carl Paladino, Larry Quinn and Patricia Pierce – did not respond as speaker after speaker chided them for their decision to bring Weimer aboard without input from the community and other board members. Weimer had been vying with Will Keresztes – a longtime Central Office administrator – for the deputy superintendent post on the assumption that the new deputy would take over when Ogilvie steps down. But last week, Ogilvie noted that Weimer no longer wanted to be considered for the deputy post and called off the search. Members of the board’s minority bloc, who had been pushing for a national search for a new leader, called for a special meeting to discuss the next steps. Opposition to the five-member board majority’s hiring process has been growing recently. Three weeks ago, the Concerned Clergy Coalition of Western New York organized a rally on the steps of City Hall to push the board to conduct a national search for a new superintendent. That demonstration came roughly a week after members of the board’s minority bloc – Barbara Seals Nevergold, Sharon Belton-Cottman, Theresa Harris-Tigg and Mary Ruth Kapsiak – called for community support in asking for a national search, saying that they had been shut out of the process.